I discovered that Joey was a girl in July 2018. She was behaving strangely and refusing to feed. A visit to the vet revealed that she had intestinal parasites and that she was a girl! A few days after that she laid a clutch of eggs. At the time, we had had her for over 6 years and as far as we knew, she had never been with a male. I followed my husband to Germany in August 2018 and Joey was shipped here a month later. She had to be re-treated for the parasites and is now clear. She's eating fine and seems to be okay with the new enclosure. I've had a little trouble getting the temps and lighting correct, but I think we're finally good. The warm side is between 77º at night and 80º in the day, while the cool side is between 73º and 75º. Up until last week, she was spending almost all of her time in the cool side box. Last week, she pooped on the cool side box, so I had to replace it with a different hide and since then, she's been in the warm side every day. I fed her Friday and she pooped yesterday (Saturday). It's very unusual for her to poop so quickly after a feeding. We feed her adult mice, but they seem smaller than what we used to get back in the States. So, I feed her two on alternating feedings. In other words, this week, she got just one, next week, I'll give her two. In the last four days, she's suddenly super active. She's almost constantly moving about the cage, pushing at the screen and glass and burrowing under the substrate. I'm worried. On the one hand, it's nice to see her out of the hides, but on the other, she seems restless and I'm wondering if it's signaling that something's wrong. 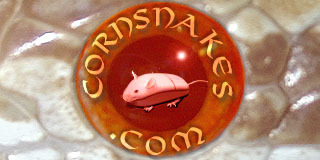 I doubt that a corn can completely digest an adult mouse in one day. I suspect that feces was still in her system from the last feeding. My corns sometimes become very active when attempting to shed, rubbing on their water bowl or the substrate. That's not unusual but I have heard of instances where dead worms blocked the digestive tract. If she were mine I would place her in a container with tepid water, about 85 degrees, for 20 minutes. Sometimes that will trigger a bowel movement, and pass any obstruction. I've had corns pass small pieces of aspen while soaking. If nothing else, she would have a nice bath. Good luck. Let us know how things turn out. The jump in activity wasn't the parasites, it was because she was about to lay. The jump in activity happened over a month after she laid. She may be looking for a mate. A belated "Thank you" for the replies. Now, her activity level seems normal again, but she is definitely constipated. I'm going to try the warm bath and if it doesn't work - to the vet we go! She could also be mad that you've figured out her true identity! Just kidding. All the best of luck to you both!